Notre cousine Anne Splingaerd-Megowan m'a demandé de pouvoir inserrer l'article qui suit: il concerne l'histoire très sommaire de son arrière-grand-père Splingaerd et de l'implication des Lin dans le développement de la ville de Lanzhou, capitale de la province Gansu, au début du vingtième siècle. Eight members of the Lin (Splingaerd) family were privileged to be invited to participate in the ceremonies on August 26th in the city of Lanzhou, China, to celebrate the 100th anniversary of the inauguration of the First Steel Bridge Across the Yellow River, now known as Zhongshan Qiao. At the gala ceremony we were conferred honorary citizenship, and regaled with gifts and banquets with local dignitaries. It was a joyful and memorable event for which we are grateful not only to the officials who invited us, but also to the man who links us to the bridge, Paul Splingaerd. Paul Splingaerd was my great grandfather who began life as an orphan in Brussels, but over his 41 years in China he became known as “the famous Belgian mandarin.” Known by the Chinese name of Lin Fuchen, Paul served for 14 years as customs inspector at China’s western frontier after traveling throughout China with Ferdinand von Richthofen and a few years as a fur trader in Mongolia. Eminentl Viceroy Li Hongzhang appointed Paul to the post in Gansu province, where Paul also conducted prospecting missions. Paul knew the area well, and three of his sons married ladies from Lanzhou. Although Paul died before the bridge was constructed, books and newspaper articles in both Belgium and China credit him for having proposed the bridge to his friend and benefactor, Viceroy Peng. Among the objectives of his trip to Europe in 1906, was the recruiting of Belgian engineers and steel manufacturers for the construction of the bridge. Although he was able to engage scientists and engineers to develop other projects projects, and to ship numerous goods back to Gansu, he returned from Belgium without a signed contract with any Belgian engineering firm. Unfortunately Paul died in Xian shortly after his return to China. The Belgians who were recruited by him to Lanzhou to help develop the area formed the nucleus of a busy Belgian community in which his eldest son Alphonse Bernard (Chinese name was Lin Ah De) played an active part. Since the Belgians in Lanzhou considered the bridge Paul’s project, and expected his eldest son, Alphonse (Lin Ah De), to pick up where his father had left off, none of the Belgians pursued the bridge project. This opened the window of opportunity for other firms, both British and German, to approach the viceroy for the lucrative contract for the bridge. 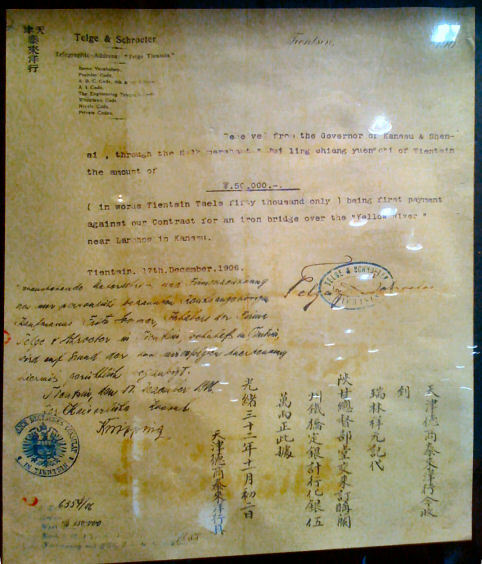 A respected German firm, Telge & Schroeter in Tianjin, prevailed, and signed a contract (see below), for the bridge within weeks of Paul’s demise, and in partnership with another German company, completed the project in the summer of 1909. The Lanzhou planning committee of the 2009 Bridge Centennial tried to find descendants of the actual builders of the bridge to include them at the centennial as well, but were not successful. So how did they find the Lin descendants? In 2005 when researching material on Paul for my book, The Belgian Mandarin, I was able to reach members of my grandmother’s family in Lanzhou. Our two branches had lost touch for nearly 60 years, but with the help of a friend in Tianjin, Isaac Huang, a translator by profession, contact was made. Being able to communicate with members of my grandmother’s family, the Zhangs, set off a wonderful sequence of events. It turned out that my dad’s first cousin, Aunt Zhang Jian Qin, is married to a professor of history at Lanzhou University. One of his associates, Mr. Deng Ming, was a historian and city archivist. When the office of the regional Archives of Gansu learned that I was looking for information on the Splingaerd involvement in Lanzhou and Gansu, they went into their files in search of any reference to the Belgian Lins. On September 29, 2005, I arrived in Lanzhou, with two cousins, Angela Cox Elliott of Vancouver, and Frank Keet of Perth, Australia, both descendants of Paul’s eldest son, Alphonse. At a meeting with the provincial archivist, I was given photocopies of references to Lin Fuchen and Lin Ah De from archives, and all three cousins were given books in Chinese that included mention of the Lins and the bridge. I, in turn presented the archivist with photocopied pages of references to Lanzhou and Gansu from my own research, and Angela presented the archivists with a photograph from her mother’s family album that was taken on the occasion of the inauguration of the bridge in 1909. The documents from the archives indicate that although Alphonse was not involved with the actual construction of the bridge, he acted as Viceroy Peng’s interpreter and counselor in dealings with the foreign community of Lanzhou, which included mining, textile and manufacturing experts as well as the bridge builders. On October 2, 2005, the day the ‘foreign’ cousins boarded the train that took us away from our re-discovered Lanzhou relatives, Ms. Zhang Hong Xing, an enterprising and well-connected cousin, sent word through our interpreter that in recognition of the material we had provided to the Archives, we would be invited to the celebration of the 2009 centennial. As the centennial approached, cousin Hong Xing was able to persuade the organizers of the event to expand the number of invitations to include other descendants of Paul Splingaerd, and she prevailed. With the help of Isaac Huang conveying and translating messages between Hong Xing and Lin descendants, a total of 8 descendants were able to attend. I am the granddaughter of Paul’s second son, Remy. The other attendees were descendants of Alphonse. 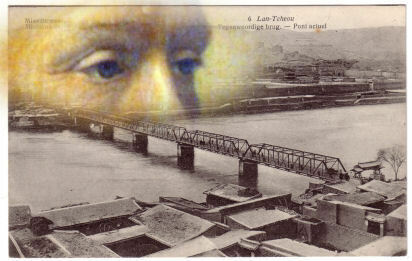 Although Paul did not live long enough to even see the beginning of its construction, I sense that through his descendants he was present at the grand celebration of the 100th anniversary of the historically important and now venerable bridge he dreamed of providing for the citizens of Lanzhou and those who travel through their city. Avec cet article très intéressant, je crois que tout est dit sur la présence des Lin lors de la construction du pont. Lin Ah De n'y a participé éventuellement qu'en tant qu'interprète pour le compte du vice-roi et le pont n'est pas celui que Lin Fuchen a construit. Ce pont a été un espoir, un rêve sur lequel Paul Splingaerd a beaucoup travaillé, c'est tout ce que l'on peut dire. Tout ce qui est dit par l'auteur de l'article est vérifié et historique. Toute autre information, éventuellement fantaisiste, que l'on ferait circuler et dont la presse se ferait écho, représente un danger pour les familles de tous les descendants de Lin Fuchen, dès lors que des tiers démontreraient qu'elles ne sont pas conformes à la réalité. Nous y perdrions notre crédit. Gardons les mythes et les légendes de famille pour nous et ne les transformons pas en vérité historique. La vérité historique est que, seuls Paul Splingaerd et son fils Remi François Xavier Splingaerd ont entreprit de négocier la construction du pont dès 1900. On connait la suite. "Paul tire un salaire de 15.000 francs....Remi tire 100 dollars par mois.... Ils essayent être chargés de la construction du pont à Lantchou....."
With this article very interesting, I think everything is said about the presence of Lin at the bridge. Lin Ah De there is possibly involved in as an interpreter on behalf of the Viceroy and the bridge is not that Lin Fuchen built. This bridge was a hope, a dream which Paul Splingaerd has worked hard, that's all we can say. Everything that is said by the author of the article is checked and history. Any other information, perhaps fanciful, that we would move and which the press would echo, is a danger to the families of all the descendants of Lin Fuchen, when others show that they do not conform to the reality. We lose our credit. Let the myths and legends of family and we do not transform into historical truth. The historical truth is that only Paul Splingaerd and his son Remi Francis Xavier Splingaerd have proceeded to negotiate the bridge since 1900. We know the result. "Paul draw remunerations of 15,000 francs....Remi draw 100 dollars per month.... They try become in charge of the construction of the bridge at Lantchou....."